While the Shelter offers immediate and sometimes life saving housing for homeless persons in great need, SHAL Outreach is helping to move people experiencing homelessness along a path toward self-sufficiency and non-institutional housing. SHAL Outreach provides individual case management for sheltered and unsheltered homeless persons in Key West and Monroe County. SHAL Outreach brings services directly to the homeless clients, with regular weekly walk in counseling at numerous locations in the Lower Keys. Case Managers provide scheduled homeless services several days a week at the Shelter, the Marathon Library, the Key West Library, the Key West Senior Center and St. Mary’s Soup Kitchen, with more locations being added all the time. SHAL Case Managers Elicia Pintabona, Amy Yancich and Channing Lamar meet with hundreds of homeless clients each month. SHAL Outreach Director is Elicia Pintabona. Sometimes the economy of Monroe County is just not conducive to success. People who come to the Keys for the climate, the entertainment, the seafood and the laid back atmosphere can find themselves struggling economically due to relatively low wages and the high cost of living, especially housing. SHAL Outreach, through grant programs and private donations, relocates these individuals back to the mainland, to an area with lower living costs, higher relative wages, more community resources to support their particular issues, and family and friend support. This is often the best answer for the struggling homeless person and for the local community. We do not just “ship our problem out,” but spend time and resources working with the new location to be sure that the person is indeed benefiting from a better place to live. We do require that the person agree not to return to the Keys, avoiding a revolving door issue. A successful program, called Housing First is being instituted around the country with upwards of 90% success rates. Rather than focus on treatment and substance abuse prior to assisting homeless clients into permanent housing, this strategy places suitable persons directly into housing, which can move a person much more rapidly toward self-sufficiency. Improvements in health, self-esteem, employment and nutrition can be quick and dramatic, helping to add a formerly unproductive and needy person to the roles of more satisfying and evolving member of our community. And, though it may seem counter-intuitive, the costs to a community for Housing First are only a fraction of the traditional system of shelters, transitional housing, emergency and other medical treatment, incarceration and judicial system costs. An informative and humorous video about Housing First from The Daily Show is on the home page of this website. SHAL Outreach is establishing such a program, using housing subsidies for homeless residents of our community, both currently sheltered and unsheltered. 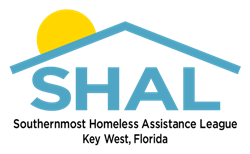 A generous grant to SHAL from the Monroe County Board of County Commissioners Human Services Advisory Board (HSAB) provides funds to match a client’s savings to support housing entry costs (first and last month’s rent, security deposit) for homeless persons to obtain permanent, suitable housing. This subsidy is in the form of a “forgivable loan.” The loan will be forgiven over an affordability period as long as the person remains housed in the dwelling, is a good tenant, and follows the rules of the program. As financial management and education is vital to the client’s success, SHAL is requiring its participants to attend a SHAL Financial Literacy class that outlines the program, teaches budgeting, discipline and money management techniques. The benefits to the client are enormous: Physical, psychological, emotional health is increased greatly. Self-esteem is allowed to return. Security of their belongings is established. The need for substance abuse and other personally destructive activities is reduced. The possibility for a return to financial well-being is greatly enhanced. Similar programs in other communities boast as high as a 90% success rate. And for the local population, this portion of the HSAB grant remains in the community in the form of rent to local landlords. Because this program is by design “scattered site,” the formerly homeless citizens will not be concentrated in any one area of Monroe County. SHAL Case Managers facilitate this program (paid by funds from other grants and SHAL’s operating budget) working with local landlords to establish an inventory of homes to guarantee that our clients are being placed in suitable and safe residences. As SHAL is the leading link with the homeless in Monroe County, our case managers are uniquely qualified to select clients for those most likely ready to be successful and become productive members of our community. Case Managers will regularly follow up with the both clients and landlords to resolve problems and help ensure success. Working with local businesses and CareerSource Florida, and in tandem with SHAL Shelter Operations, SHAL Outreach connects homeless clients with employers and employment training. A Challenge Grant from Florida state government initiated a program in 2015 that has helped to find employment for dozens of Key West and Monroe County residents. SHAL uses grant money to prepare clients for employment, providing uniforms and tools, transportation and other services to increase the chances that our client will be successful. Local businesses have responded, with certain employers telling us that parts of their operations will be staffed exclusively with SHAL clients. Good health is a critical part of a return to productive society. Besides the difficulty of a homeless lifestyle on other parts of life, health can suffer greatly. Sadly, two clients actually died in the Shelter during 2015; homelessness is a life-threatening condition. Days in the blazing sun of the Florida Keys and poor sanitation only exacerbate health problems in our aging homeless population. To address this need, SHAL has continue to work with the Monroe County Health Department with monthly nurse visits to the Shelter to provide vaccines, HIV testing and flu shots for clients. In 2015, SHAL partnered with Visiting Nurses Association to provide weekly services at the Shelter. Each Thursday morning, VNA nurses see clients for triage, wound treatment and other services to assist the homeless on their path to self-sufficiency. SHAL provides this vital service through its operating budget. And even more exciting, also in 2015, SHAL Outreach partnered with the Rural Health Network of Monroe County (RHN) to provide free diagnostic services, testing and prescriptions for our homeless clients. Many homeless clients suffer from long-term or chronic conditions like high blood pressure, diabetes, and conditions that require regular supervision and medication. Persons enrolled in SHAL Case management can make appointments at RHN and receive their prescriptions through RHN’s 340b program. RHN heavily subsidizes these programs, with medication available through a growing number of local pharmacies. SHAL continues to partner with the MCSO Jail program, specifically the Jail In-House Program (JIP). We have provided relocation, case management, housing assistance, and transportation to incarcerated, or recently released individuals referred to us by the JIP program. Most recently, we began offering our financial assistance class to level two JIP members with a promising turn out. The JIP staff is very appreciative of our continual efforts to assist their program attendees.